The Yankees are up to their old tricks, putting together a championship-caliber club with a combination of a stocked prospect pool and deep, deep pockets. Thanks to the former, they’re reportedly on the verge of trading for starter Gerritt Cole, and thanks to the latter, Giancarlo Stanton is now in pinstripes. And it’s the latter that has one crosstown owner pissed off. 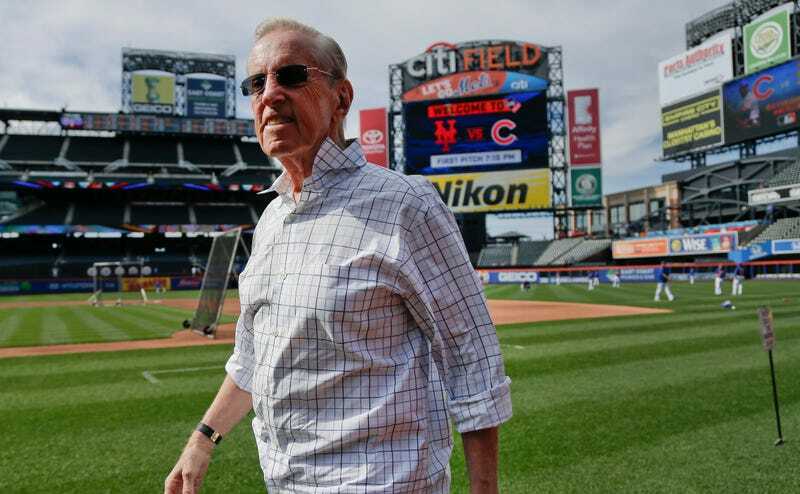 According to the New York Post, Mets co-owner Fred Wilpon—who does not talk to the media—is “irate” over the Yankees’ latest big acquisition. A cynic might offer the observation that the Yankees’ economics being unsustainable would provide cover to Wilpon for refusing to emulate it—for refusing to spend with the league’s top teams, even though the Mets play in the country’s biggest market and have proven that when they’re good, the fans will come out. Said cynic would also offer that since the Yankees’ model does appear to be sustainable—they’re actually on target to get under the luxury tax threshold for the first time in forever—it just makes Wilpon look all the worse and far more concerned with profits than with building a good baseball team. There’s a rub here. The Wilpons are still stinging after getting caught up in Bernie Madoff’s Ponzi scheme, to the tune of nine figures. To shore up finances, the Mets have taken out loans from MLB and Bank of America, and explored selling minority stakes in the teams, all the while keeping payroll somewhere below what it would need to be if the Mets were serious about competing above all other factors. So while Fred Wilpon’s stance on the Yankees might receive some sympathy from fellow owners, he’ll receive none from actual Mets fans. The Wilpons received a defense from an expected source earlier this week, when former Mets GM Steve Phillips pleaded with fans to identify with the rich men who want to be richer. The Mets, 12th in the league in payroll last opening day, are expected to cut about $20 million for 2018.